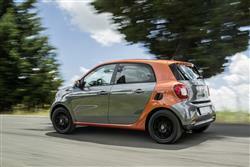 Like the idea of smart's fashionable little fortwo, but need more than two seats? 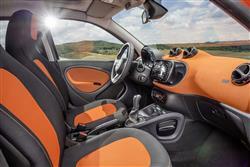 Then you'll like this, the brand's five-door forfour. Still concentrated smart, still clever, still small - but just that little bit more usable. It competes in a tough sales environment, hence the importance of this model's uniquely space-efficient rear-engined layout, a set-up that virtually every other manufacturer has considered - and then rejected - for use in this segment. With this in mind - and having already burnt its fingers by getting the first generation version of this car wrong - it was perhaps not surprising that smart owner Daimler sought to hedge its financial bets by developing this design in partnership with another brand - Renault the chosen one. Hence the reason why this model shares almost everything with the third generation version of the French maker's Twingo citycar - except perhaps a uniquely smart-orientated sense of style and joie de vivre. 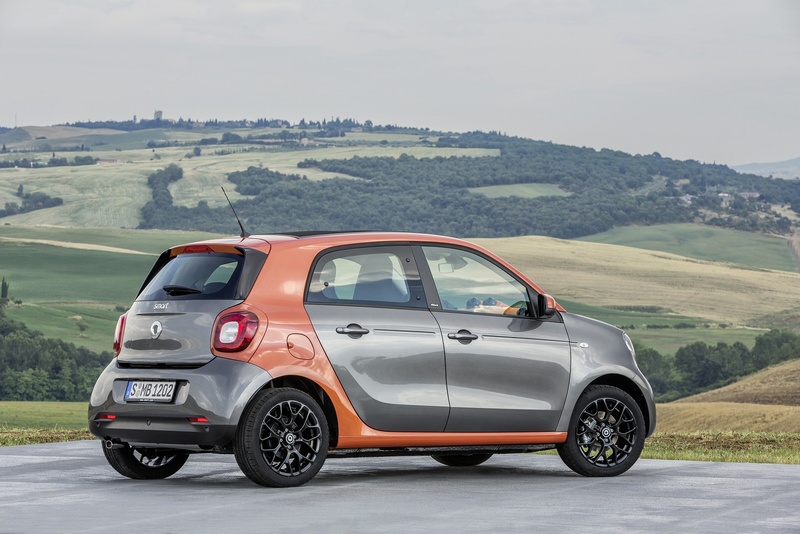 There really wasn't a lot of mechanical commonality between the old smart fortwo and the original forfour model, but this time round, the forfour is essentially a stretched fortwo, in this instance sharing around 70% parts commonality with the Renault Twingo. Customers get to choose between 71bhp and 90bhp engines, the former a normally-aspirated 1.0-litre unit and the latter an 899cc turbocharged item. Unless you knew beforehand, there is little in the forfour's handling characteristics that suggests it's rear-engined. Neither of the two engines are particularly rapid, and both will require a bit of rowing along on major roads. The 71bhp car gets to 62mph in a yawnsome 16.9 seconds, while the 90bhp models take a more presentable 11.9s. Smart promises better refinement at speed compared to the Twingo thanks to additional soundproofing. Another piece of good news is that the hideous semi-automatic gearbox that plagued smarts for years has been ditched and in comes a slick five-speed manual 'box with a six-speed twin-clutch automatic following on its heels. There's also a full-electric 'electric drive' variant powered by a 60kW (81bhp) electric motor. Whatever your choice of variant, the 8.65m turning circle means you'll have no problem diving back for a parking spot and the steering has been deliberately made very light to make city manoeuvring extra simple. 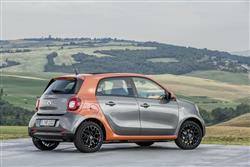 Whereas the old forfour really had to stretch to try to carry off the smart family look, this one couldn't really be anything else. 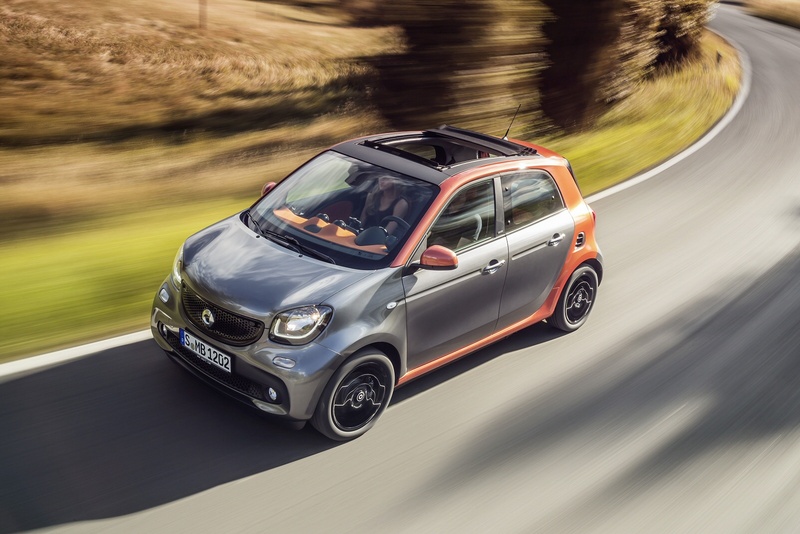 It really does look like a smart fortwo that's been Photoshopped into something longer and shares the smaller car's pug-like front end and the hallmark tridion safety cell. There's a lot of shape in the flanks, from the swage lines near the door handles to the almost Volvo-like shoulder line that's most apparent as it melds into the rear light cluster. Look down and there's a genuine concavity to the lower door panels, smart going a bit further than sticking a curved detail on there as you'd get on a Renault Clio or Captur. 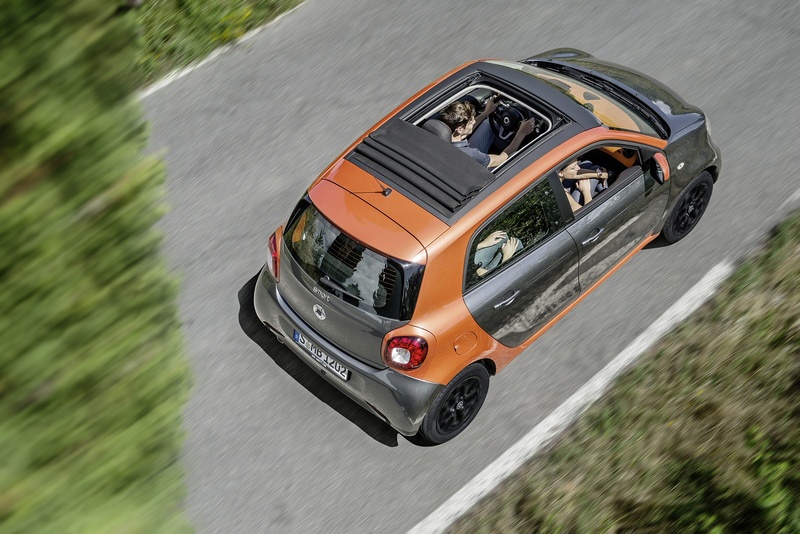 The cabin features as many quirky touches as you can stomach and it's good to see smart pushing the boat out a bit with colours and textures, including a technical mesh finish. At the prices charged, this should be a car that feels premium and different to the usual citycar norm. It's still not huge inside, and the boot measures a mean 180-litres. The good news is that the rear doors open to 85 degrees (which makes getting in the back simple) and the rear seats fold completely flat, offering up to 975-litres of space. 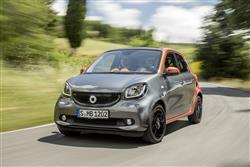 The smart brand has moved to make this car look more affordable in recent times, introducing an entry-level 'pure' trim level priced at around £10,500. Move to mid-range passion trim and you'll be looking at paying just under £12,000, with the prime model commanding nearly £1,000 more and the proxy version priced identically. The base-spec 'pure' variant gets electric front windows, remote locking, a smart audio system, electrically adjustable and heated door mirrors, height-adjustment for the steering wheel and driver's seat and LED daytime running lamps. The plusher 'passion' variant is fitted with 15" eight-spoke alloy wheels, automatic climate control, Bluetooth connectivity and a choice of either an orange/black interior or a white/black interior. The prime features 15" five-twin-spoke black alloys and gets a panoramic glass roof with sun protection, as well as black leather upholstery, heated seats and lane-keeping assist. Additional dashboard instrument pods with a cockpit clock and rev counter are a returning smart staple. Upgrade to the proxy and you'll find 16" rims and a blue and white interior with Artico and cloth upholstery. It also gets the Sports Package which includes a sports leather multifunction steering wheel, suspension lowered by 10mm, rubber studded alloy sports pedals and an exhaust finisher in chrome. Should you wish to go further, the optional Premium package will ask around £800 of you and deliver rear parking assistance, a smart media system with navigation, a height adjustable steering wheel and heated, electrically adjustable door mirrors. Premium Plus is only offered on the upper two trims and includes all of the above, as well as ambient lighting, a 'coming home' lighting function, LED headlamps with a light guide, rain and light sensors and a rear view camera. That'll set you back around £1,3000, which seems far from exorbitant. 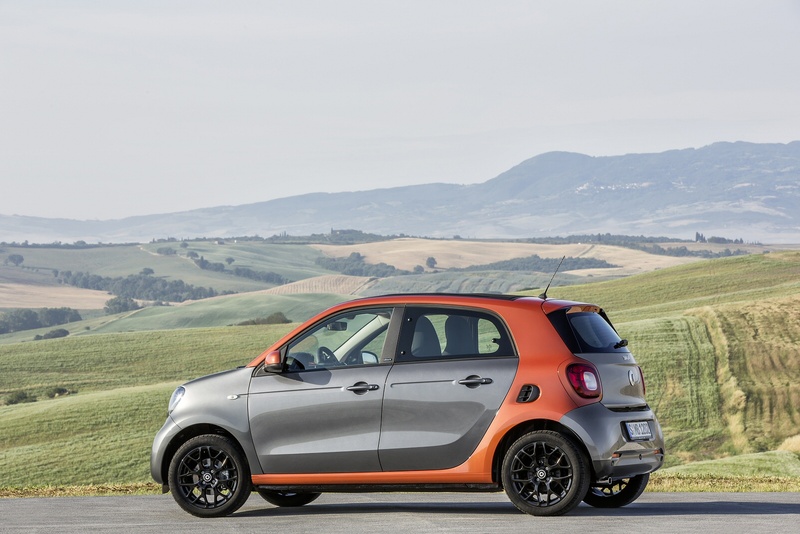 Choose a smart forfour with a manual gearbox and the 71bhp engine, as most UK customers do, and you'll have a car which will return 68.9mpg on the combined cycle and emit just 93g/km of carbon dioxide. That's only 1.2mpg down on the two-seat fortwo and definitely redeems what we thought were slightly lacklustre numbers for the smaller car. Choose the 899cc turbo model and although it's a bit quicker, efficiency isn't dented too badly. Here you'll manage 67.3mpg and 97g/km. Slightly more disappointing is the fact that while Renault offers a four year warranty on the Twingo, you only get three years with a forfour. Still, it is an unlimited mileage deal and you also get 'smart move assist', an included twelve month international roadside assistance package that can be renewed annually following a smart dealer service. If you�re looking for a new smart forfour hatchback 1.0 Prime 5dr Petrol Hatchback for sale, you�ve come to the right place. At Bristol Street Motors we don�t just have the best smart forfour hatchback 1.0 Prime 5dr Petrol Hatchback deals, we also offer friendly advice and help with all your enquiries to ensure your buying experience is a happy experience.